Being the leading names in the industry, we offer our clients timely executed range of Machine Tool Repair Service that is used to increase the functional life of machinery. Our professionals employ advanced technologies and facilities in executing the entire services. Catering to the requirements of our customers, we are involved in providing Repairing Service to our honorable customers. These Repairing Services are rendered under the supervision of our experienced professionals who hold several years of experience in this domain. Also, these services are timely delivered. Use our repair services to restore your Kennametal pocketed and non-pocketed tools to like-new condition. See how much performance life your worn tools still have in them. Repair them today! We are Authorized Service Center for Dynabrade Pneumatic Tools and Aeroline Pneumatic Tools. We have inventory of regular spares parts. Our company is betrothed in providing Power tools Repairing Service to our customers. Our experts have prosperous industry acquaintance and knowledge of this realm. Our experts always work with full dedications to render this service within given time period. Banking on the skills of our qualified team of professionals, we are instrumental in rendering Pneumatic Tools Repairing Service. 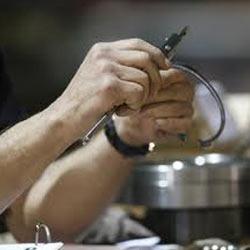 We are massively indulged in offering to our patrons Air Tool Repair Service. Due to our devotion and specialization towards the quality, these services are enormously valued by our clients. Apart from this, these services are executed by nimble personnel as per the patrons’ demands. To uphold the standing we have built up in this enormously competitive industry, we are readily involved in bringing forth Undercutting Tools Repairing Service. Extensively demanded in the market, these provided services could be accomplished form us with supremacy. In addition, our ability to deal with their altered solutions makes us a poplar market choice. - We want to looking more queries from MP , INDORE , PITAMPUR , DEWAS , BHOPAL Regions. Nozzles Bosch Nozzles are designed to withstand the heavy demands of today's diesel engines. On average, a diesel nozzle fires 1, 000 times per minute, so precision and durability are important features. Each Bosch Nozzle is engineered for exacting precision and durability, to deliver a long, reliable service life for consistently superior diesel engine performance.